Maturity presents itself in many unexpected forms. One day, you’re stuck in bed cradling a bowl of rice and watching Meryl Streep movies, nursing the worst hangover you’re sure anyone has ever had. You’ve WebMD’d all your symptoms, cursed Burnetts, and vowed to start a new life next week. One full of good decisions, and possibly the occasional vegetable. Before you know it, you’re paying internet bills and making budgets and saying foreign things like “I can’t go out tonight, I have a deadline tomorrow”, “I’ll just have one glass of wine, 60 minutes is airing an interesting special on conspiracy theories tonight and I want to be sober enough to remember it,” and “are these carrots organic?”. It happens to the best of us. 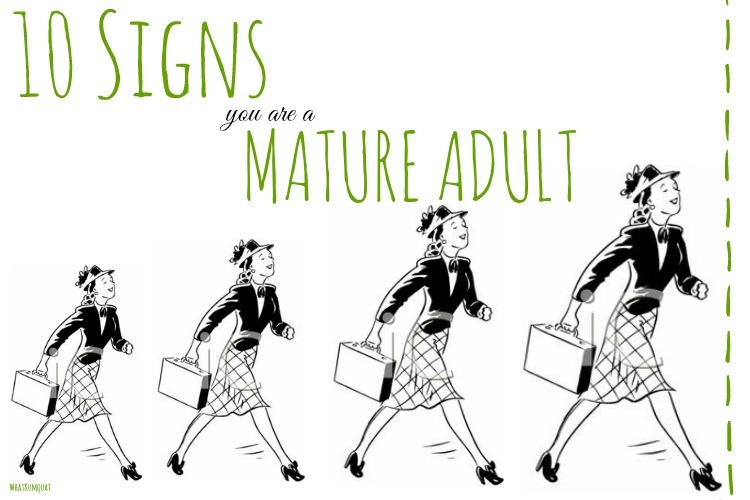 Here are 10 signs you are becoming a mature adult. You recently bought a blender and got so excited you had to sit down and take a moment to collect your thoughts. You have caught yourself saying something along the lines of “this red has an oaky taste, with notes of wood and overtones of black pepper”. You have actually spent recent Sundays not dying of a hangover. You may have spent a few at a farmer’s market perusing the leeks. You are someone who buys leeks. You may not have a mortgage or fully know what it is, but at least you do know that it has something to do with owning a house. You can afford the Venti size at Starbucks. You have REAL CHEESE that doesn’t resemble dust in your refrigerator. Which, by the way, is not a mini fridge! You know how to write a cheque. You decide to walk the four blocks instead of calling an Uber, because exercise and budgets are things you are rapidly becoming familiar with, despite all efforts to the contrary. Oh no! I’m guilty of 4, 6, 8, 9 and 10. Lol’d at these! 3 and 7 are definitely my favorite lol. I laughed at the first one. For my 18th birthday, my grandparents bought me a nutribullet. It was my favorite gift that year. Today, I couldn’t sit down + relax (on my day off!) until the living room was vacuumed. Drivers license says 19, habits scream 40, lol! Dying over this post! You are hilarious, Elly! Number nine is so applicable, especially because I continue to lose my check book. Good to know I’m not alone!! I always joke with my friends on how I’m the grandma in the group, haha. I died at number 3! Hahaha YES! I totally vouche for needing to sit down after buying an appliance. After we bought out crock pot, it was a whole bunch of giddiness on our way home from Walmart. Hahaha I love these! Made me feel like an actual adult, especially since I haven’t spent a weekend hungover in months! Such a great reminder for all of us, great job! Haha, I love this! But it looks like I’m turning into a real adult, AH! LOL #10 is me, for real. Walked to the dentist instead of calling an Uber because life.